This topic contains 8 replies, has 2 voices, and was last updated by obit 1 year, 9 months ago. This trio of macros is used to adjust your angle of attack for whatever you’re intercepting. These are awesome at setting up your target for a 90/-90 plasma attack. I made them years ago with precisely that in mind. But it also turns out that they’re great for “going over” (or under) asteroid fields. These are in every one of my macro sets. In the picture, we are intercepting a target ship with the same Z elevation as us. We want to get above that ship so we can rain plasma straight down at it. Incoming plasma from below or above can be harder to dodge than plasma originating at the same Z elevation. So we intercept and then modify our course to have a +45* nose-up condition. 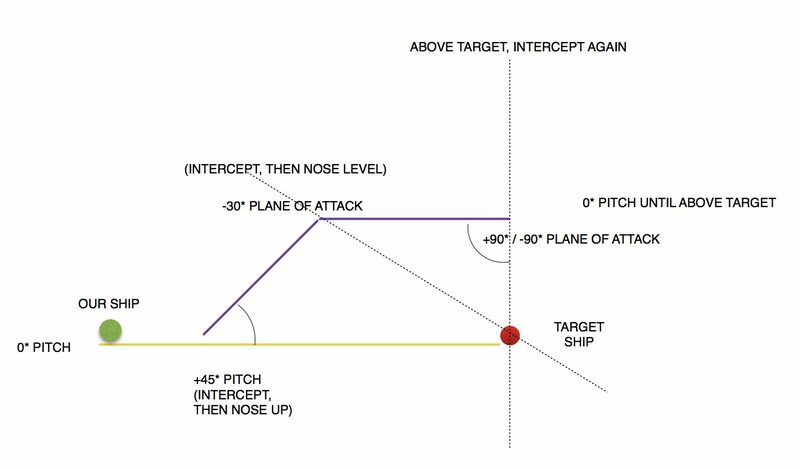 Once we have gained enough Z elevation above the target, we intercept again but then adjust our nose to be completely level (0* pitch). Note that we have about a 30* relative position to our target at this point, which is why we level out the nose- so we don’t lose our elevation. As we move forward, our distance won’t change much, but our relative Pitch will drive towards 90*. When it hits 88*-90*, we are “above” our target and will intercept again, possibly with a plasma-firing macro. This is the plane we will make our attack from. Hopefully our target ship intercepts us at some point while we’re directly above, which will render their azimuth-only (left/right swing) plasma dodge macros ineffective. From this angle, we will attack normally with phasers/mines/plasma and unless the target has wised up and started using my plasma dodge macro, we will probably do some serious damage.